It can be hard to remember to set money aside for your goals when there are so many more immediate things to spend it on. That’s where we come in! Dupaco can help you make saving automatic with a few simple tools. That way, you can pay yourself first without even having to think about it. Set up your paycheck to be directly deposited to your checking account. From there, you can have a set amount of money automatically distributed into multiple accounts, such as your savings account, children’s savings accounts, a Holiday Club account, or a loan account. 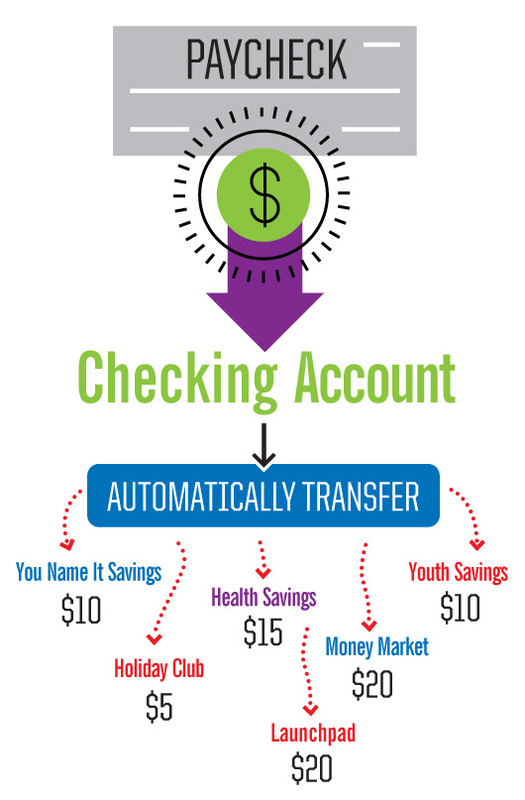 Auto-transfers can be set up to automatically distribute money from your checking account to multiple savings accounts. For example, auto-transfers can ensure that $20 per month gets stashed away to your vacation savings account each week without you having to think about it. The new ChangeUp Savings tool enables you to have your “loose change” from debited transactions automatically deposited into your savings. All you need to participate is a Dupaco checking account and corresponding MoneyCard/debit card, along with a primary savings account. If you are eligible to participate in ChangeUp Savings, you can enroll by following the prompt located on the Detail Screen of your checking account in Shine Online and Mobile Banking. Want a dedicated savings account for a specific goal—such as a vacation or an emergency fund? You name it! Automatically set aside money into an account and name it whatever you choose. Save all year long for the giving season and avoid added stress by setting up a Holiday Club account. A set amount of your paycheck will be automatically transferred to this account throughout the year, making the holidays a breeze! Did you know? In 2018, Dupaco members saved a record-setting $4.93 million through their Holiday Club accounts. Learn how to simplify holiday gift-giving this year. Launchpad is a savings account that helps you build momentum towards retirement by helping you establish and grow savings at your own pace. Unlike an IRA, Launchpad has no tax benefits, nor tax consequences or reporting. Learn more about Launchpad and if it's right for you. Start paying yourself first today! Contact a member service representative at (563) 557-7600 / 800-373-7600, ext. 206, or service@dupaco.com to set up your systematic savings plan. Hello, I opened a holiday savings account this year. When and how are the funds able to be spent? Do you send a check, deposit the balance to my checking? Some other way? Thanks for your help. Hi Cathy, Holiday Savings Account funds will be deposited into your checking account at the end of this month.